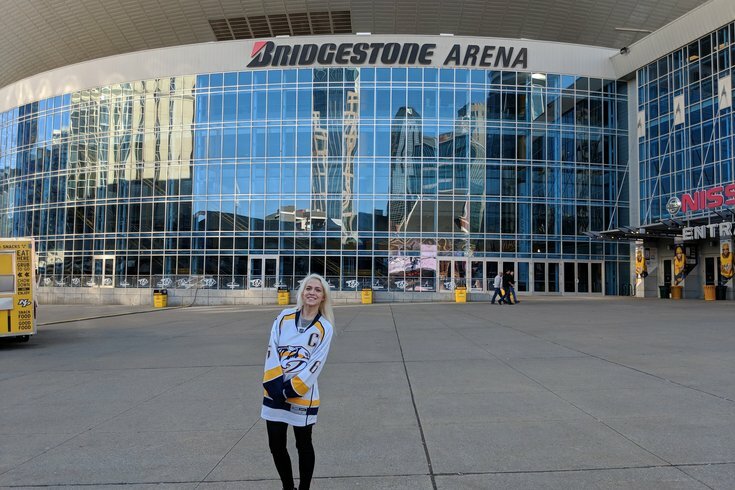 Sydney Sanders of Northeast Philadelphia poses in front of Bridgestone Arena in Nashville for a Predators game. Only problem? The game was being played in Newark, New Jersey. Sydney Sanders of Northeast Philadelphia decided to treat herself for her 23rd birthday on Friday. So, she booked a two-hour flight to Nashville, Tennessee, to see the Predators play the New Jersey Devils at Bridgestone Arena on Thursday. It wasn't until after she made her travel plans that she double checked the Predators schedule, only to realize she could have driven two hours to see the game where it was actually being played in Newark. "I was like, 'Oh my god, it’s only two hours away from home,'" Sanders told PhillyVoice. Her mix-up went viral. Sanders decided to take the trip anyway — after all, Nashville is more of a destination than Newark — and just watch the game from a bar. While having a drink at nearby Tootsies, she posted a photo of her next to the arena, acknowledging her flub. The tweet has since gotten more than 500 retweets and been picked up by various national sports blogs. To her surprise, the team quickly responded, asking if she was still there. They told her to wait outside, so she downed her drink and "bolted" back to the arena where the Predators had a birthday gift for her to make up for missing the game. "They gave me a signed book, luggage tag, a scarf, a rally towel and a schedule so I don't mess up that bad ever again," Sanders joked. As with anything fun or lighthearted on the internet, there were a fair share of curmudgeons looking to spoil her sudden social media celebrity status. Some called her dumb, while others claimed the whole thing was a pre-planned plot to get free stuff. "And of course, there are the blonde jokes too, but I'm used to those," Sanders said. There were also those who questioned why a Philadelphian would be a Predators fan. Sanders defended herself, saying she just loves hockey, and while the Flyers are her No. 1 team, Nashville is her Western Conference squad because of her longtime love of former Predators defenseman Shea Weber, after whom her dog is named. Weber has since been traded to the Montreal Canadians, but she noted current Nashville coach is Peter Laviolette, who led Philly to a Stanley Cup appearance in 2010, is still there. Asked if she'll ever return for a home Predators game, Sanders said her plan is to visit every NHL arena, so she has to eventually. For the time being, however, a trip to Nashville in January certainly has to be better than driving to the middle of New Jersey, right? "I've only drove through (Newark). It doesn't look like there's too much to see there besides a hockey game," she said. "There’s so much to do (in Nashville). There's literally something no matter what block you're on."